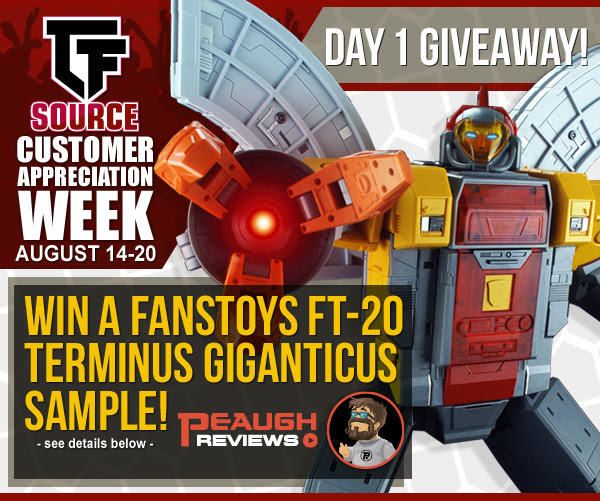 TFSource Customer Appreciation Week – Day 1! MT Yellow Giant $200! Trash-talk & Cogwheel with M.F.B $50! FT Terminus Giganticus Sample Giveaway! Trash-Talk & Cogwheel + M.F.B. Subscribe to Peaugh’s YouTube Channel. Comment on Peaugh’s FansToys FT-20 Terminus Giganticus review using #TFSOURCECAW Click here to watch the review. Giveaway ends on August 15 at 7am pst. Copyright © 2017 TFsource, All rights reserved.